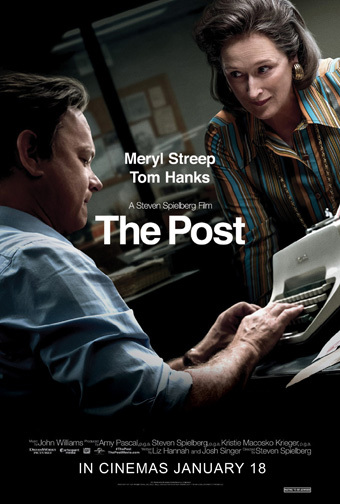 Synopsis: In a world where journalism is under attack, Marie Colvin (Rosamund Pike) is one of the most celebrated war correspondents of our time. Colvin is an utterly fearless and rebellious spirit, driven to the frontlines of conflicts across the globe to give voice to the voiceless, while constantly testing the limits between bravery and bravado. After being hit by a grenade in Sri Lanka, she wears a distinctive eye patch and is still as comfortable sipping martinis with London's elite as she is confronting dictators. Colvin sacrifices loving relationships, and over time, her personal life starts to unravel as the trauma she's witnessed takes its toll. 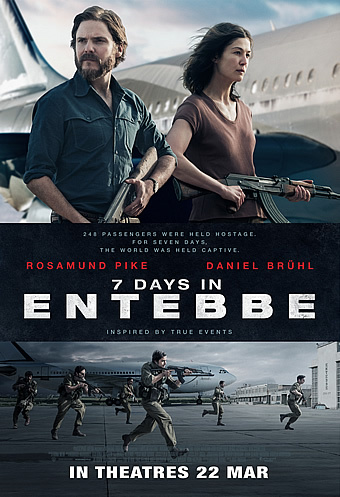 Yet, her mission to show the true cost of war leads her -- along with renowned war photographer Paul Conroy (Jamie Dornan) -- to embark on the most dangerous assignment of their lives in the besieged Syrian city of Homs. 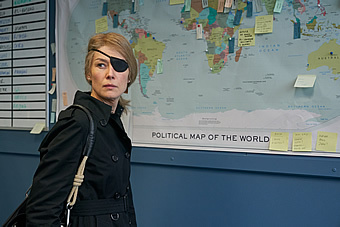 Rosamund Pike puts in a career-best performance as war journalist Marie Colvin in A Private War written by Arash Amel (Grace of Monaco), which in turn is based on a Vanity Fair article. 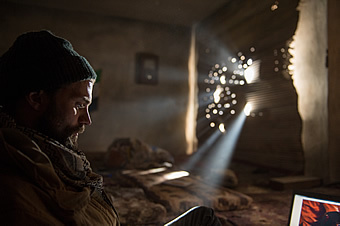 A Private War is a powerful drama that showcases the amount of effort that goes into war articles in the papers. A war correspondent is not just a novelist or a journalist who writes about a fictional war happening in the Middle East or covers the next accident on the road; he or she is an ordinary yet fearless individual who ventures into war zones with the rest of the trained, armed personnel to bring you the latest coverage of conflict in the “comfort” of shrapnel and heavy artillery. America born, London-based Marie Colvin is one such person. The movie takes viewers on an episodic journey into the last ten years of Colvin’s career before she was fatally killed while covering the siege of Homs in Syria in 2012. Colvin is painted as brave, complex and inspiring in her career as she struggles to maintain a normal life outside the atrocities of war. Could it be her failed marriages and the inability to conceive that drives her into one war zone to another? Or is it the adrenaline and the lure of fame that propels her? 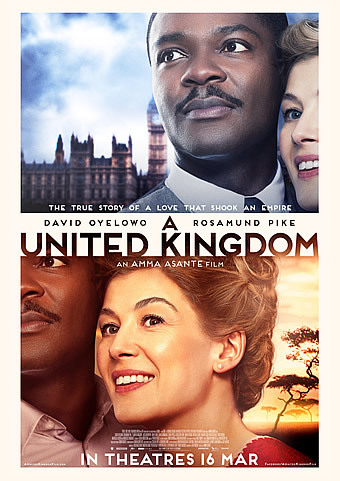 Of course, there’s no straightforward answers to Colvin’s persistence and motivations, but the movie allows us to see the dark side of hers as she struggles with symptoms of PTSD, signs of which obvious to those who came back after witnessing the cruelty of wars. But Colvin’s consistent denial about her condition probably drives her back to what she does best, despite losing an eye during an ambush in Sri Lanka. Though she has previously surprised us with her tour de force performance in Gone Girl, Pike is once again amazing as the revered Colvin. 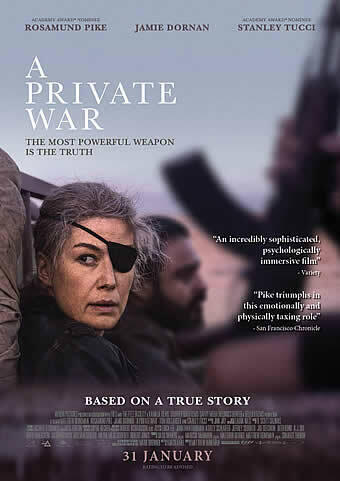 Maximising every emotion in her body to inject dynamism into the role and presence of Marie Colvin, Pike is compelling to watch every second she is onscreen, as she faithfully chain-smokes, drinks and transforms herself flawlessly into the tortured soul of the late war correspondent. Jamie Dornan, whom you might know from a little seedy movie called Fifty Shades of Grey, plays Colvin’s trusty cameraman and go-to IT man, Paul Conroy. Dornan is unexpectedly good opposite Pike. And there’s two worthy scenes in the movie, one where Colvin bares her soul to Paul in a recovery house and the other where Colvin explains why she donned expensive, flashy lingerie that proved Dornan can do more than shedding off his shirt. 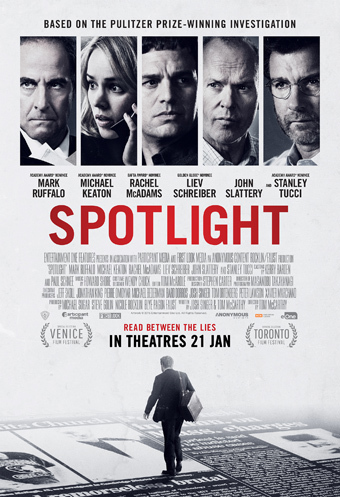 Other notable faces include British actor Tom Hollander who plays Sean, Colvin’s editor who questioned her conviction during a heated argument, and Stanley Tucci in a small role as one of Colvin’s lovers. A two-hour movie might not entirely serve full justice to Marie Colvin’s achievements and beliefs. But documentarian turned movie director Matthew Heineman’s feature debut is a brilliant character study on one of journalism’s true heroines. Heineman’s skill in conveying loss, fear and violence (without actually showing a lot of them on the screen) is likely a tribute to what Colvin has put down on pens and papers. Meaning you read and feel about the perils without really watching any of it. A Private War closes appropriately with shots of Colvin’s news articles to the sad tune of Annie Lennox’s Requiem for a Private War. Undeniably, this movie is no fake news in the making, it’s simply a bare powerful testament of Marie Colvin.